Psychological: Megan, Trevor and Tim are on location at the 2014 Salty Horror Con. We talk horror shows and what scares us. In this episode, Cortney, Trevor and Tim discuss Marvel’s recently announced slate. We also discuss the new Star Wars subtitle and Toy Story 4. In this podcast we discuss the new Avengers trailer, what we are thinking about Interstellar and whether we are on board with 3 Avatar sequels. 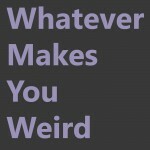 In this episode of “Whatever Makes You Weird” Trevor Tim and Cortney talk about the all-female Ghostbusters reboot movie. We also discuss the new Tomorrowland trailer that just went live….